Vanguard has taken Leo, Mike and the Cyborg to his ship that orbits the Earth. As Vanguard explains to Leonardo that he’s a soldier from another galaxy sent here to guard Earth against invasion from his people’s enemy, Mike arrives and presents to the pair his newfound squeeze – a female mutant turtle who loves to smooch! Vanguard gets angry and yells at the girl “turtle”, named Lurch, to change back to its natural form. Mike is shocked as his “girlfriend” transforms from being his idea of a hot date into a shambling mass that appears to be a rough statue made of wet clay. Vanguard explains that Lurch is a morphling, an artificial being created in a lab – it has the intelligence of a dog and spends most of its time trying to escape, but it apparently took a shine to Mikey – who asks if there’s any Draino that he can gargle with. Vanguard leads the boys to another area of the huge craft, where Roxanne Wells (who happens to be Vanguard’s girlfriend) is still researching Johnny Raeburn on the ship’s computers. Raeburn had killed 28 children before one managed to escape and notify police. He was convicted and sentenced to 12 consecutive life terms, but he joined an experimental space program, called Seeker, to avoid that sentence. Instead, Raeburn and a crew of other convicted criminals were sent into space to “serve” humanity by using their lives to explore the unknown. The killer left Earth in 1979 on Seeker 3 and the mission went well until the craft passed beyond radio contact in 1992. Raeburn’s final message was a cry for help that most NASA personnel felt was a sick joke – but Roxanne and Vanguard believe that he was attacked and absorbed by a Turellan and then returned to Earth seeking revenge. Vanguard explains that his eyebot, named Wally, is running tests on the Turellan exoskeleton and Don’s cyborg body – so they should go see how their brother is doing. Onboard Vanguard’s spaceship, Wally tells Leonardo that Donatello is definitely brain dead. Leo argues that’s impossible, as Cyborg Don is still walking, talking, eating and belching – he’s got to be alive, his thoughts are just being overridden by the computer inside the body (like they were in issue six). Wally states that there is absolutely no detectable brain wave activity inside the Cyborg – Don’s body is alive, but his mind is gone. The Cyborg then awakens and explains that the Mutagen from Don’s bloodstream interacted with its CPU and evolved it to the point of sentience… so while the Cyborg’s brain lives, Donatello’s does not. It’s true that if Don’s body was destroyed, the Cyborg would die as well, but since it had its own “brain”, the loss of Donatello’s organic mind was not catastrophic. Leo is enraged and accuses the Cyborg of purposefully allowing Donatello to be killed so it could take over the body. The Cyborg explains that it was merely following Donatello’s orders, to not interfere unless asked – and Don didn’t ask for help when he was attacked by Deathwatch. Leonardo is still angry and states that the Cyborg is an accessory to his brother’s murder and he draws his blades. 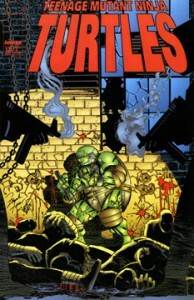 The Cyborg warns Leonardo not to threaten it, and Mikey steps in to break up the potential fight. Wally then intercedes and announces that Raeburn managed to escape – the remains of his body were only 2% human tissue, most of it was the exoskeleton. Vanguard arrives and surmises that the Turellan’s may have access to some form of teleportation. Mike states that they’ll have to hunt Raeburn down, and Vanguard shows them film of the Seeker 3 crash landing in Sheldon, Arkansas – Johnny Raeburn’s hometown! Vanguard invites the Turtles to join Roxanne, Wally and him to investigate the site and the group beams down. The next morning at Aprils’ apartment, Raph is in bed with an ice pack on his head from where Casey greeted him with the baseball bat the night before. April worries that Raph has a concussion, but the Turtles insists he’s fine – until he tries to get out of bed and the pain in his head forces him to lie back down. Casey explains that he thought Raph was a mobster coming to kidnap Shadow again. Jones then says that the mobsters that Raph “offed” in the van won’t be informing on them anymore, but Raphael explains that he had nothing to do with their deaths. Raph forces himself out of bed so he can go question the Foot about the killings, but before he leaves, he gives Shadow a hug and tells her take care of April and Casey while he’s gone. The rest of our heroes arrive in Arkansas near the crash site and immediately find a human corpse strung up like a scarecrow. They find two more dead bodies at the crater where the Seeker 3 crashed. Raph arrives at the warehouse that the Foot Council resides at and thanks them for protecting his friends while he was gone. The leader asks if they were able to find Master Splinter, but Raph reveals that they did not. The Foot master regrets this news, as they’d like to ask Splinter for advice on their situation – the conflict between the Foot and the Puzorelli mob has erupted into a full blown gang war. One of the Council stands and announces that Raph’s failed assassination attempt on Big Tony and Mike’s rescue of Shadow infuriated the mobsters and some of the Foot wish to return Shadow to Tony – since he is her grandfather. Raph gets angry and states that Casey married the girl’s mother and raised her as his own and they won’t be surrendering her to anyone.